An oncology nurse is a nursing professional who specialises in caring for people with cancer. Oncology nurses often serve as the first line of patient’s communication and help coordinate many aspects of cancer care. They assist the radiation oncologist in ensuring appropriate and accurate presentation of medical records, assessing and monitoring patient’s physical and emotional status, and collaborating with allied healthcare professional in providing a holistic care plan for patients. 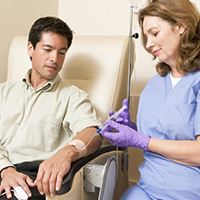 Oncology nurses also ensure safe administration of medications, fluids, and treatment involving intravenous infusions such as chemotherapy. They are heavily involved in patient education, ensuring that patients understand their disease, treatment plan and side effects. Oncology nurses monitor patients closely throughout their cancer treatment journey and aids patients in planning for and managing side effects.